I’m sorry to say this scene ends here. However, this Thursday we’ll learn something else about Cyril. I am shipping this TO THE MOON. Thank you so much, Britny! I don’t fully trust him yet he seems kind of off? Being smitten can do that to a guy. I STILL DON’T TRUST YOU MR. SALMON. When I read that I couldn’t help singing “Mr Salmoon, bring me a dreeeeam…” This is getting out of hand. This is a gorgeous page. This page is stunning. There’s endless room to explore for my eyes which I’m really happy about. ♥ Also Cyril is looking like the perfect boy, even if a little bit too much. Now I can’t decide who I have more of a crush on: Rogier or Cyril! 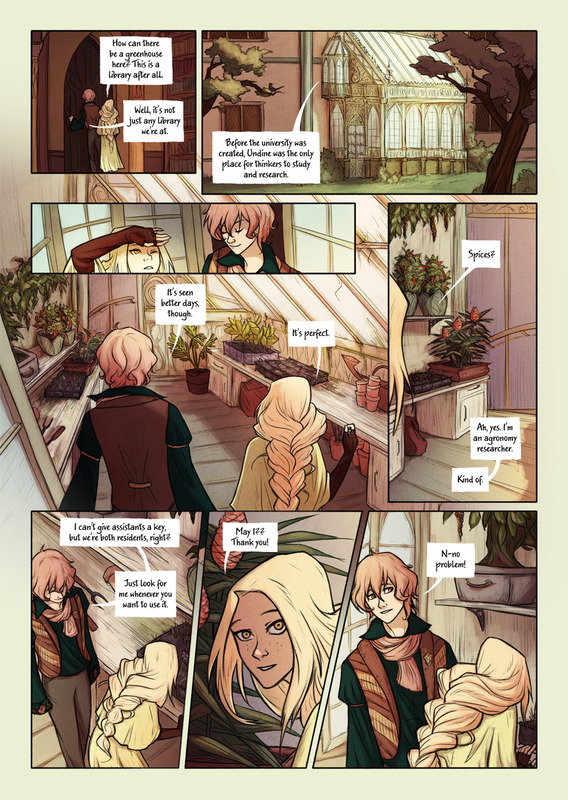 I need that greenhouse in the worse way …and a passionate-about-plants assistant too. Four greenhouses, actually, but one can be plain. One for more demanding orchids and smaller humid loving tropicals, a large one for tall and climbing tropicals, one for regular frost-tender plants and a simple larger plain one for starting outdoor plants early and temporary retirement for plants during their dormant period. I don’t think it’s too much to ask for. I’m willing to share offshoots and cuttings with others too! Got to say I love the glimpses of Victorian Wardian cases I’ve seen and it pleases me that you’ve used them! I get the feeling you love plants too. Living on a low fixed income, I’ll never get the chance to go to the UK, but it’s a dream of mine to visit Kew Gardens and spend a couple of months visiting different public gardens there.